The International Labor Organization (ILO) defines pneumoconiosis as occupational and environmental dust accumulation in the lungs and the resulting tissue reaction. Dental technicians working in an unfavorable work environment in Turkey and across the world may develop pneumoconiosis as a result of exposure to dust.,,, This is defined as dental technician pneumoconiosis. In many cross-sectional studies, the prevalence of dental technician pneumoconiosis has been reported to be 4.5%-38.6%.,,,,, It is one of the business sectors where pneumoconiosis occurs most frequently in our country. In the Worldwide Orthopedic Market research report, the global dental implant industry was foreseen to reach a trading volume of $4.2 billion in 2015 and $9.1 billion in 2018. In the light of the general sales data of IMPLANTDER representatives sector, dental implants sales were foreseen to be about 350,000 pieces in Turkey in 2013. According to the records of Local Health Administration, about 1650 licensed dental laboratory exists in Turkey, and there are 114 registered dental prosthesis laboratories in İzmir. It is known that these establishments are producing for both domestic and abroad markets, mainly in France and Germany. The health education and Health Manpower Status Report published in 2014 in Turkey revealed that a total of 4135 dental prosthesis technicians and dental technicians were employed, including 1192 employees by the Ministry of Health, 126 employees in the universities, and 2817 in the private sector. In recent years, dental technicians are controlled by legal regulations with annual periodic examinations; when necessary, they are referred to the institutions authorized to diagnose occupational diseases. Our clinic is one of the reference centers for the diagnosis of occupational diseases in Turkey. To shed light on the present situation of pneumoconiosis in dental technicians in Turkey, sociodemographic medical characteristics and study histories of the patients who were diagnosed with pneumoconiosis in our clinics were evaluated for the past 3 years. In this study, we aimed to investigate the clinical and laboratory findings of dental technicians who were referred to us. The study consists of a case series. Between 2013 and 2016, a total of 750 subjects were applied to our University occupational diseases clinic. Seventy patients who were working as a dental technician and referred to our clinic with suspicion of occupational disease were evaluated. Patients with active tuberculosis or previous tuberculosis history were excluded from the study. All the subjects were evaluated by a specialist of chest diseases and occupational diseases. Anamnesis and comprehensive work-history evaluation were performed with face-to-face interviews and physical examination was realized. Respiratory symptoms such as a cough, sputum, shortness of breath, and wheezing were also questioned in the anamnesis. Demographic characteristics, age at start of work, duration of exposure, time from first exposure to the present, cigarette history, complaints, functional status, lung graphs, and high-resolution computed lung tomography (HRCT) findings were recorded. The lung graphics at the time of diagnosis were evaluated and the radiographs were classified according to the 2000 ILO radiological evaluation system for pneumoconiosis. Posteroanterior chest X-ray (PA graph) that was obtained when the patients were first applied was evaluated by an occupational disease specialist who was a certified B reader based on the ILO International Classification of Radiographs of Pneumoconiosis. HRCT was obtained in patients whose PA graph was evaluated as profusion 1/0 in the periodical examination at the workplace, and then referred to our clinic with suspicion of pneumoconiosis. All PA graphs were evaluated considering the ILO 2011 classification. According to this classification, small opacities with a frequency greater than 1/0 were considered as pneumoconiosis. Because we are the reference center and due to medico legal reasons, the diagnosis was determined for patients with 0/1 in PA graphs and normal subjects through HRCT. A few millimetric nodules in a single or limited area in the HRCT evaluation were not considered as pneumoconiosis. The follow-up of these subjects was suggested. If available, previously obtained PA graphs and thorax computerized tomography (CT) and HRCT were also evaluated. In HRCT, opacities with relatively spherical shape, 3 mm, and smaller diameters were defined as “micronodule,” opacities with 3 cm and smaller diameters as “nodule;” also the homogeneous diffuse increase in lung parenchymal density was defined as “consolidation.” According to the ILO assessment, those with profusion 0/1, 1/0, 1/1, and 1/2 were classified as category 1, profusion 2/1, 2/2, and 2/3 as category 2, and profusion 3/2, 3/3, and 3/+ as category 3, respectively. The same technician, using Sensormediics Vmax22 0.6-2B spirometer device, in accordance with the American Thoracic Society (ATS) criteria, performed spirometric examinations. The spirometric data of the patients were evaluated as a percentage of the expected result (% predicted). Statistical evaluations were performed using the package Pasw Statistics Program for Windows Version 18.0 (SPSS Inc.). The mean, median, minimum, maximum values, and standard deviations of the obtained data were calculated. Pearson's correlation coefficient test was used to assess the relationship between spirometric results and radiological findings. A P value of <0.05 was considered statistically significant. In all, 46 (65.7%) of the 70 dental technicians who were referred to our hospital were diagnosed with pneumoconiosis. Eleven (23.9%) of the subjects were referred by the workplace physician, 12 (26.1%) were referred by social security institution (SSI), and 23 (50%) were referred by chest diseases specialists. About 45 (97.8%) subjects were male and 1 (2.2%) was female. Around 24 (52.2%) subjects had various symptoms. The mean age of getting diagnose was 34.43 ± 4.2 (22-46) years, and the mean age of starting to work was 15.89 ± 2.79 (11-23) years. In all, 34 (73.9%) of the subjects were smoking and the mean pack year was 12.28 ± 9.99 (0-46). The average mix dust exposure time was 176.13 ± 73.97 (18-384) months. About 42 (91.3%) subjects had been worked in the sandblasting section, 37 (80%) in the metal leveling section, 16 (21.7%) in the vax polish, and 10 (21.7%) subjects had worked in one of the other sections. The average expected values of FEV1 in functional evaluation were 77.78% ± 16,73%, FVC 83.69% ± 15.26%, FEV1/FVC 78.36% ± 10.04%, and MEF25-75 78.10% ± 21.34% [Table 1]. 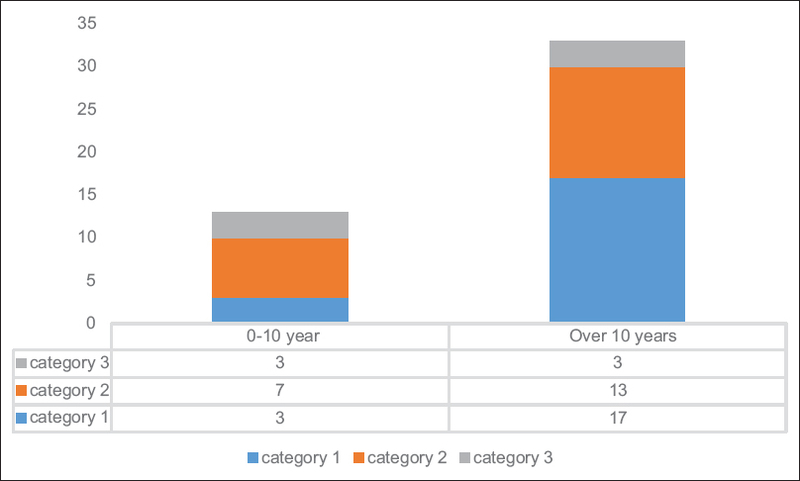 According to the duration of exposure in patients working 10 years or less, three subjects were evaluated as category 1, seven subjects as category 2, and three subjects as category 3. For 10 years and above, 17 subjects were classified as category 1, 13 were classified as category 2, and 3 as category 3 [Figure 1]. None of the subjects had a history of long time exposure to biomass or to asbestos. Physical examination revealed that two subjects had bilateral fine crackles on the lung bases, and one subjects had expiratory rhoncus. The evaluation results of PA graphs in terms of pneumoconiosis according to ILO classification are shown in [Table 2]. The most common small round opacities were identified. 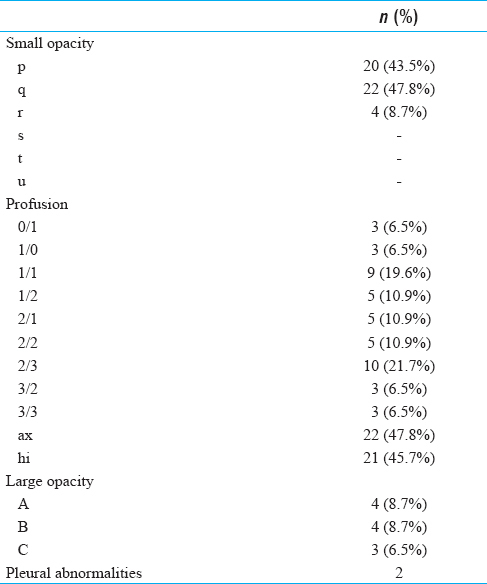 In 16 patients, high profusion being 2/3 and above were identified, and large opacity was detected in 11 patients. Three (6.5%) subjects who were evaluated as 0/1 in PA graph were diagnosed with pneumoconiosis with HRCT findings. Micronodule and lymphadenopathy were the most common in 46 subjects with HRCT findings. Consolidation, conglomerate masses, and iced glass opacities were defined, in addition to reticular opacities [Table 3]. The radiological profusion had a weak negative correlation with the FEV 1 and FVC measurement (correlation coefficient −0.18, P = 0.210 and correlation coefficient −0.058, P = 0704), There was also a moderate negative correlation between radiological profusion and FEV1/FVC (correlation coefficient −0.377, P = 0.010). In addition, no correlation was observed between the age at start of work and the duration of exposure. After the completion of the clinical evaluation, the SSI, ministry of labor control units, and public health institution of the ministry of health were informed about the subjects and workplaces. The presence of pneumoconiosis in dental technicians is an indication of the limitations in the effectiveness of occupational health and safety practices in dental laboratories in Turkey. Çımrın et al. evaluated 212 dental technicians, and in 33 (23.6%) subjects, they detected radiological findings consistent with pneumoconiosis. 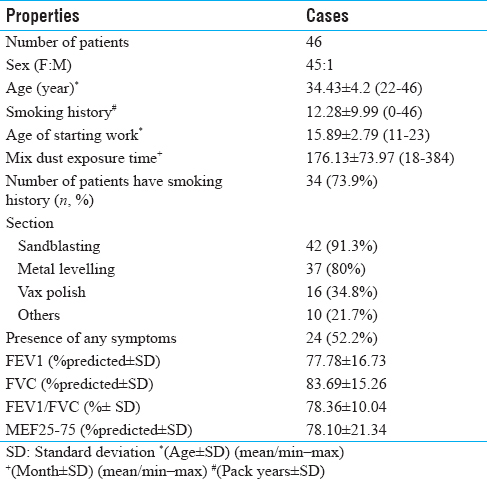 The frequency of pneumoconiosis was determined as 50% in workers with a history of sandblasting. In our study, 42 (92%) of the subjects had made sandblasting in some of their professional lives and 37 (80%) were making metal leveling. It is remarkable that most of them began the profession at early ages; especially in the apprenticeship period, they had done sandblasting which causes intense silica exposure, and there was a marked exposure to dust in metal leveling department. Because of these characteristics, silicosis remains a common disorder in dental technicians. In recent years, awareness of the risk of dust increased with new legal regulations, especially in work branches with dust exposure such as dental technicians; periodic examinations and referral of suspected subjects and further evaluation and early detection of the subjects have come to the agenda. The reason for referral to our clinic is that radiological findings have been detected in the periodic examination of the subjects. Patients with abnormal findings as a result of periodic examinations were referred by the workplace physician to chest disease specialists or diagnostic centers responsible for diagnosis of occupational diseases. The reason for the diagnosis of pneumoconiosis as high as 46% (65.7%) of 70 subjects is that the subjects who are directed to our outpatient clinic are the selected patients. The average age in work-based cross-sectional studies in Turkey is 28.1-34.7 ± 8.5-9.0 years, and the average age of starting at work in Turkey is 18.8 ± 5.2 years.,,, Our findings highlight that dental technician profession requires a long period of experience that includes apprenticeship training. This feature of the work also forms the cause of regular and long-term exposure. In Çimrin et al. 's study consisting of 214 dental technicians, at least one respiratory complaint was found in 100 (46.7%) subjects. In our study, there were 24 (52.2%) patients with symptoms and no symptoms in the other half. Smoking is important; although in symptomatic subjects it is not correlated with the presence of comorbid problems such as pneumoconiosis severity and asthma. The results may be related to a few number of symptomatic subjects. There is no consensus on the use of HRCT as a screening tool in the early diagnosis of pneumoconiosis. However, according to the PA graphs, occupational interstitial disorders such as asbestos and pneumoconiosis, especially in the early diagnosis, are more sensitive. In a study conducted by Staples et al., 169 patients with asbestos exposure, being normal in the PA lung graph (with ILO profusion <1/0), were evaluated, and 57 of these subjects were found to be compatible with pneumoconiosis in HRCT. Kahraman et al. also used HRCT to diagnose dental technician pneumoconiosis, and the prevalence was found to be 46%. Although many studies on HRCT have been carried out during pneumoconiosis screening, it is not accepted as a routine practice today., In this study, three (6.5%) subjects were diagnosed with pneumoconiosis, who were referred due to suspicion of pneumonia, and who were evaluated to have profusion 0/1 in PA graphic, but with HRCT findings of pneumoconiosis. Heavy metals' exposure such as quartz and chromium, cobalt, nickel, beryllium, and iron powder occurs in the dental prosthesis construction process. Nayebzadeh et al. showed the presence of these minerals in lung tissue of dental technicians with pneumoconiosis., As we have seen in other studies,, micronodules were the most frequently detected radiological finding (38%-89%). Another radiological finding is the presence of mediastinal Lymphadenopathy (LAP)., In 67.4% of our subjects, we observed LAP in mediastinum regardless of parenchymal findings. In addition, Alıcı et al. determined more mediastinal LAP in the lungs of dental technicians, than ceramic workers, sandblasters, welders, and mining workers. It has been shown that mediastinal laps detected in dental technicians may also be associated with berylliosis. However, in our subjects, additional immunological investigations could not be carried out. Subjects were evaluated for active TBC infection and TBC lymphadenitis, and no advanced invasive procedures were required during the diagnostic process. Subjects were begun to follow-up. Restrictions: the present study group was limited to patients who admitted to our clinic. The results of the measurements of the patients' workplaces were not obtained due to the fact that there was no regular and appropriate measurement in our country. Also, we could not sample dust and gas levels in these workplaces. Lymphocyte proliferation test could not be performed in patients with LAP. A relationship between the level of pneumoconiosis profusion and working hours was not shown. It may be due to a low number of subjects and the changes in exposure intensity at workplaces. Their productions are an export item especially to European Union countries, not limited to domestic production, so the influence of working conditions on the health of employees is not only a national problem but also international important. For this reason, the international consumers may also be responsible for occupational health problems that arise in the production of dental implant production in Turkey. Both the consumer and the persons and companies that are parties to this trade have legal and moral responsibilities. As a result, the presence of pneumoconiosis continues in dental technicians in Turkey. Dental prosthesis workers are exposed to a considerable amount of silica and different metals' dust. Especially because there is an early childhood apprenticeship culture and almost all workers in this period have the history of sandblasting; dental technician pneumoconiosis is a common disorder in our country. This shows that there are serious restrictions associated with workplace and employee health monitoring. Sherson D, Maltbek N, Olsen O. Small opacities among dental laboratory technicians in Copenhagen. Br J Ind Med 1988;45:320-4. Torbica N, Krstev S. World at work: Dental laboratorytechnicians. Occup Environ Med 2006;63:145-8. Karaman EC, Itil O, Gülşen A, Kargi A, Cimrin A. Dental technician's pneumoconiosis; a case report. Tuberk Toraks 2008;56:204-9.
International Labour Office. Guidelines for the use of theILO International Classification of Radiographs of Pneumoconioses ILO Occupational Safety and Health SeriesNo. 22. Revised edition. Geneva: ILO; 2011. p. 1-11. Kartaloglu Z, Ilvan A, Aydilerk R, Cerrahoglu K, Tahaoglu K, Baloglu H,et al. Dental technician's pneumoconiosis: Mineralogical analysis of two cases. Yonsei Med J 2003;44:169-73. Ollagnier C, Tolot F, Perrin LF, Bongard G. Une observationde silicose chez un mecanicien dentiste. ArchMaladies Professionelles 1962;23:385-6. Willard JJ, Personne C. Note medicale concernant une silicose nodulaire. Eur J Toxicol 1969;2:79-82. Choudat D, Triem S, Weill B, Vicrey C, Ameille J, Brochard P, et al. Respiratory symptoms, lung function and pneumoconiosis among self employed dental technicians. Br J Indus Med 1993;50:443-9. Selden AI, Persson B, Bornberger-Dankvardt S, Winström LE, Bodin LS. Exposure to cobalt chromium dust and lung disorders in dental technicians. Thorax 1995;50:769-72. Ergün D, Ergün R, Evcik E, Öziş TN, Akkurt İ. The relation between the extend of radiological findings and respiratory functions in pneumoconiosis cases of dental technicians who are working in ankara. Tuberk Toraks 2016;64:127-36. Cinkara M. Kahramanmaraş ilinde çalışan diş teknisyenlerinde pnömokonyoz sıklıǧının deǧerlendirilmesi. Master thesis. Kahramanmaraş; 2011. Doǧan DÖ, Özdemir AK, Polat NT ve ark. Prevalence of respiratory abnormalities and pneumoconiosis in dental laboratory technicians. Tuberk Toraks2010;58:135-41. Alıcı NŞ, Çımrın A, Coşkun Beyan A. Pneumoconiosis in different sectors and their differences in Turkey. Tuberk Toraks 2016;64:275-82.
http://www.marketsandmarkets.com/Market-Reports/dental-implants-prosthetics-market-695.html. [Last accessed on 2018 Mar 22]. http://www.saglik.gov.tr/TR,11659/saglik-bakanligi-turkiyede-saglik-egitimi-ve-saglik-insangucu-durum-raporu-2014.html. [Last accessed on 2018 Mar 22]. Ödev K, editors. Toraks Radyolojisi. 1st ed. İstanbul, TÜRKİYE: Nobel Tıp Kitabevleri Press; 2005. American Thoracic Society. Standardization of spirometry: 1994 update. Am J Respir Crit Care Med1995;152:1107-36. Çımrın A, Kömüs N, Karaman C, Tertemiz KC. Pneumoconiosis and work-related health complaints in Turkish dental laboratory workers. Tuberk Toraks2009;57:282-8. Berk S, Dogan DO, Gumus C, Akkurt I. Relationship between radiological (X-ray/HRCT), spirometric, and clinical findings in dental technicians' pneumoconiosis. Clin Respir J 2014;10:67-73. Kahraman H, Köksal N, Cinkara M, Özkan F, Sucaklı MH, Ekerbicer H. Pneumoconiosis in dental technicians: HRCT and pulmonary function findings. Occup Med 2014;64:442-7. Suganuma N, Kusaka Y, Hering KG, Vehmas T, Kraus T, Arakawa H,et al. Reliability of the proposed international classification of high-resolution computed tomography for occupational and environmental respiratory diseases. J Occup Health 2009;51:210-22. Staples CA, Gamsu G, Ray CS, Webb WR. High resolution computed tomography and lung function in asbestos-exposed workers with normal chest radiographs. Am Rev Respir Dis 1989;139:1502-8. Mosiewicz J, Myśliński W, Złomaniec G, Czabak-Garbacz R, Krupski W, Dzida G. Diagnostic value of high resolution computed tomography in the assessment of nodular changes in pneumoconiosis in foundry workers in Lublin. Ann Agric Environ Med 2004;11:279-84. Bergin CJ, Muller NL, Vedal S, Chan-Yeung M. CT in silico sis: Correlation with plain films and pulmonary function tests. AJR Am J Roentgenol 1986;146:477-83. Nayebzadeh A, Dufresne A, Harvie S, Begin R. Dental laboratory technicians'pneumoconiosis. Am Ind Hyg Assoc J1999;60:349-53. Kotloff RM, Richman PS, Greenacre JK, Rossman MD, Chronic Beryllium Disease in A Dental Laboratory Technician. Am Rev Respir Dis1993;147:205-7.